494 pages | 192 Color Illus. Preface. 1. From Traditional to Modern Society. 2. Rediscovery of Antiquities. 3. The Age of Enlightenment 4. Classical Monuments 5. The Age of Romanticism 6. Stylistic Restoration 7. Conservation 8. Theories and Concepts 9. Dissemination of Conservation Policies 10. International collaboration. Bibliography. Index. 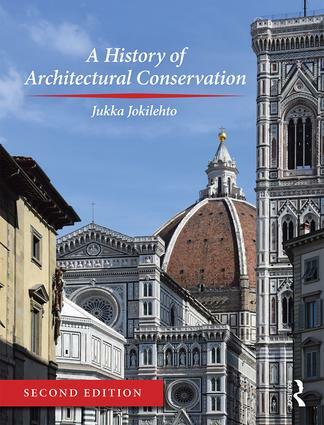 Jukka Jokilehto is Special Advisor to the Director General of ICCROM, Ordinary Professor at the University of Nova Gorica, Slovenia, and Honorary Visiting Professor at the University of York, UK. His distinguished career at ICCROM stretches over 40 years. He has represented ICCROM and ICOMOS at the World Heritage Committee and is Honorary President of the ICOMOS International Training Committee. His advisory roles with UNESCO, ICCROM and ICOMOS have ranged from China and Japan to Iran and Azerbaijan through to Italy and Norway and beyond. This book has been prepared in association with ICCROM and the University of York.